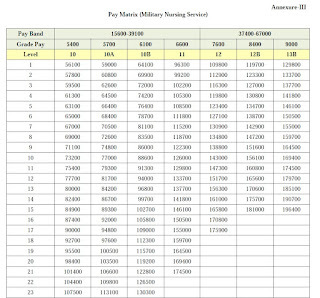 a) The existing system of Pay Band and Grade Pay has been replaced with separate Pay Matrices for both Defence and Military Nursing Services personnel. b) Fixationof pay of each employee in the new Pay Matrix as on 01.01.2016 would be done by multiplying his/her basic pay by a factor of 2.57. Note-1 With regard to fixation of pay in the new Pay Matrix as on 01.01.2016, the existing pay (Pay in Pay Band plus Grade Pay) in the pre-revised structure as on 31.12.2015 shall be multiplied by a factor of 2.57. The figure so arrived at is to be located in the Level Corresponding to employee’s Grade Pay in the new Pay Matrix. If a Cell identical with the figure so arrived at is available in the appropriate Level, that Cell shall be the revised pay; otherwise the next higher cell in that Level shall be the revised pay of the employee. Note-2 After fixation of pay in the appropriate Level as specified in Note-1 above, the subsequent increments shall be at the immediate next Cell in that Level. (vii) Recommendations not relating to pay and allowances and other administrative issues specific to department/ cadres/ posts would be examined separately as per the Transaction of Business Rules/ Allocation of Business Rules. 2. Other instructions on Pay Fixation and increment not specifically covered in these instructions will be as in the Government of India, Ministry of Finance (Department of Expenditure) Resolution 1-2/2016-IC dated 25th July, 2016. 3. The decisions taken by the Government accordingly on various recommendations of the Commission in respect of Officers of Armed Forces are indicated in the statement at Annexure-I to this Resolution.New Pay Matrix for Defence Service Officers is at Annexure-II and for MNS Officers is at Annexure-III. a) The Index of Rationalisation of Level 13A(Brigadier) in Defence Pay Matrix would berevised upward from 2.57 to 2.67.
appropriately in the Defence Pay Matrix. There would be two dates for grant of increment viz. 1st January and 1st July of every year, instead of existing date of 1st July. However, an employee will be able to avail annual increment only on one of these two dates depending on the date of appointment, promotion or grant of financial upgradation. 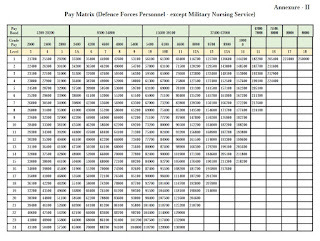 Rate of Military Service Pay (MSP) is accepted. However, MSP will be counted only forDearness Allowance (DA) and Pension. Please intimate about Defense Pensioners regarding 7th pay commission implementation for Officers and PBRO . Awaiting eagerly . Thanks . 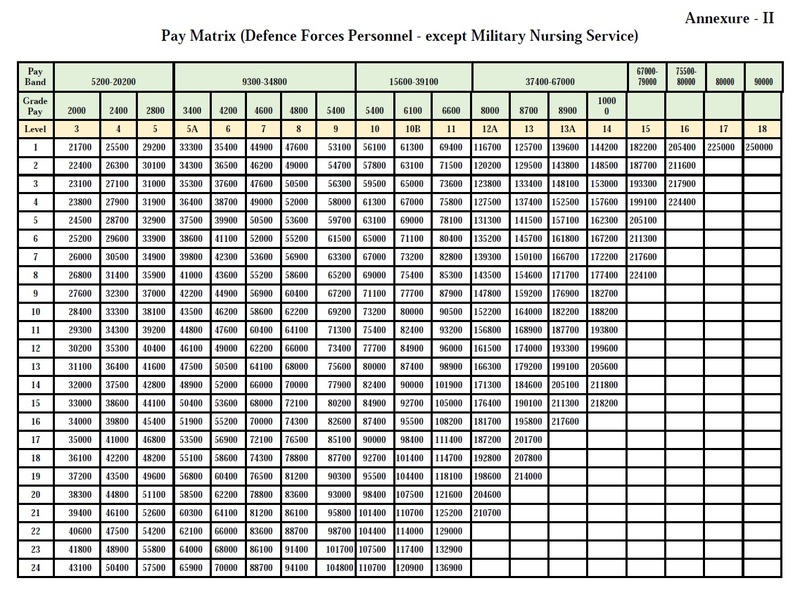 is for Officers but the chart shows the table for Other Ranks and JCOs! Is it again a delaying tactics by bureaucrats??? No mention about Defense Pensioners PBOR so far . I do not know why this is so ? Once the 7th pay commission is applicable to central Government employees/pensioners then why not for Defense sector also . Can any one tell why it is so ? Why not notification declared for pensioners yet? I too still await the govt. notification for Defense Pensioners ( as per 7th pay commission ). Why delay , I don't understand . But fully hope that it will come in force shortly . 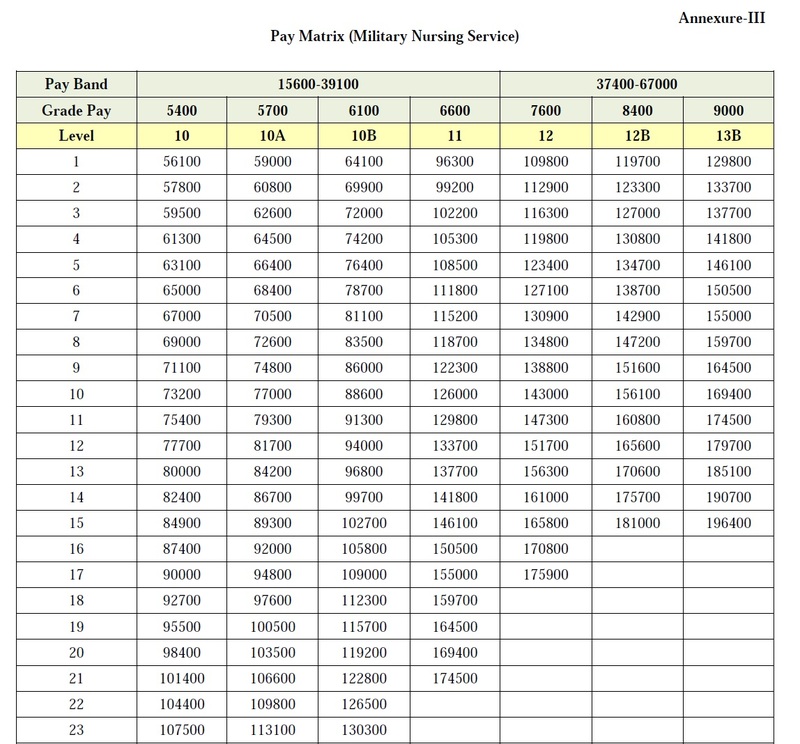 7th Pay Commission Gazette Notification issued for Defence Personnel (i) Implementation of the revised pay structure will be w.e.f 01.01.2016; a) The existing system of Pay Band and Grade Pay has been replaced with separate Pay Matrices for both Defence and Military Nursing Services personnel.